vienna. | five. years. - bitte.und.danke. Five years later, and here were are. If you’ve been reading my blog since the beginning, then you know that I always dedicate a post to a certain study abroad trip that changed me for the better. Part of me cannot believe that it’s been five years since I got on a plane and spent five unforgettable weeks in Vienna, Austria. (Part of me also thought that I’d be making the return trip back this year. Trust me, if I could, then I would in a heartbeat!) I won’t ramble on too much about how much I miss Vienna (oh, Zanoni & Zanoni!) or what Vienna means to me today (you can check out this post and this post if you want to read about all that), but I will say that I’m still very much in a Vienna state of mind. Rain or shine, every day that you’re being graced by Vienna’s positive vibes and energy is a good day. As I’ve said in years past, the thing that I most miss about my time in Vienna is waking up with a purpose. Simply put: Rain or shine, every day that you’re being graced by Vienna’s positive vibes and energy is a good day. When you’re surrounded by beautiful architecture around every corner, it’s hard not to constantly feel inspired. (There’s a reason that Vienna is named the top city for quality of life year after year.) In true Viennese fashion, I've made it a point to always look up when I'm out and about. Despite living in a small city with not-so-tall buildings or inspiring architecture for that matter, I’m always on the lookout for interesting corners and vantage points. I’m especially intrigued by the interaction between light and shadow — and how seeing a building from a different angle can completely change my perspective. It’s amazing how an experience so small can greatly impact your mood for the day. They’re flashes of delight, if you will. 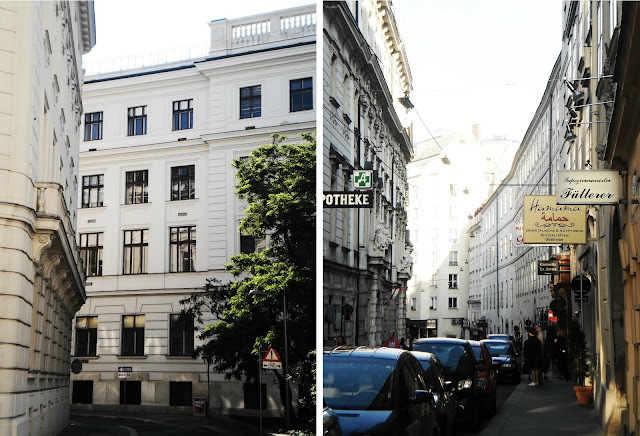 Had I not studied abroad in Vienna, there’s no doubt that I wouldn’t be anywhere near as appreciative of good design and aesthetics. While I’m not a designer myself, I can certainly appreciate “the good” when I see it. AKA, minimalist and streamlined design always makes my heart skip a beat. During my time in Vienna, I was also fortunate enough to meet and hear so many inspiring architects, designers, artists, industrial designers, etc. speak about their metier and process (sketching, making models, photographing, documenting from start to finish). I think this serves as a constant reminder to do all things in life with passion and to avoid shortcuts when the going gets tough. These are all important lessons that I hope to carry with me as I continue to seek a career that leaves me feeling just as inspired and fulfilled. I really do hope that I make it out to Vienna sooner than later. (And actually, according to my latest travel horoscope and this fortune cookie, I should be booking a trip to Vienna anytime now.) While these photos may not convey how much I miss my morning strolls through Burggarten, riding the u-bahn or how inspired I was on a daily basis, they’re memories and experiences that I wouldn’t trade for the world. As cliché as that may sound. Do you have plans to study abroad? If you already have, what are your greatest life lessons and takeaways? Share your favorite memories in the comments below!